The Philly rapper leans on his roots for some new visuals. 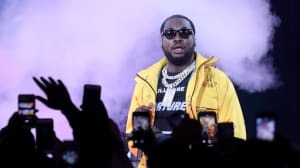 Two days after releasing visuals for "Litty," Meek Mill is back with another video, this time for a new track called "Left Hollywood," found on his recent three-track mixtape Meekend Music. The song is a multidimensional look at his roots, and the surrounding circumstances that made him who he is. As reflected in the video, that involves a lot of time in the trap house with friends watching his back. This summer, Meek Mill and Yo Gotti will embark on the Against All Odds tour. Check out dates below.